HQ Magazine is the only comprehensive source of trusted independent information and unbiased practical guidance for Australians looking for technology and solutions to help them hear better. HQ Magazine (which started life as CICADA Magazine) keeps the hearing impaired community and hearing professionals up-to-date with the latest news from around the globe on hearing technology and medical advances. Through stories on inspiring high-profile hearing-impaired people, the magazine aims to encourage readers to embrace technologies that will help them hear better. Our goal is to help remove the stigma associated with hearing impairment and help people discover technology which will remove the social isolation that can result from unaddressed hearing loss. HQ Magazine covers the full range of hearing loss and associated technologies ensuring readers are able to make informed decisions. 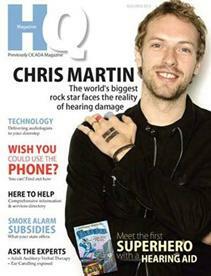 The magazine helps navigate the often confusing and emotional decision-making process of choosing hearing technology. Access information, participate with others in the HQ Community via www.hearingHQ.com.au and www.facebook.com/hearingHQ.